Soooo I don't know if you remember, but back in January on my birthday, Sabrina made me THE SWEETEST VIDEO ON THE PLANET. I knew when I saw this that I was going to have to find a way to make it up to her when her birthday came around. Well, today is her birthday and even though my video isn't anywhere near as sweet as hers was, I hope that this at least makes you smile. 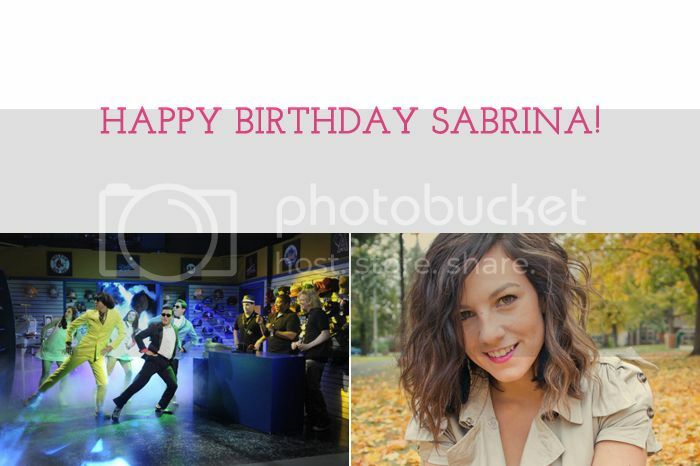 HAPPY BIRTHDAY SABRINA! I love you and I'm so VERY thankful for you, your friendship, your support, your talents, and your heart. I can't wait to squeeze your neck in Boston in 4 very short days. this is HILARIOUS! I need one for my birthday, miss! OHHHH MYYYY GOSHHHHHH. You all should win couple of the year award. Every year. I hope that my future hubby will do something like this with me! I just spit apple cider all over my desk...and that is no lie. You two are so damn funny! I just died hahaha! This is seriously hilarious! That can be a show in vegas! That was HILARIOUS! Oh my, you guys are just two of my favorite people, um, ever. :) Have SO much fun in boston! !